It’s been a busy and productive year in the Makerspace with projects ranging from handmade books to 3D printed maps of our campus for use by those with low vision. We have also been working with classes and departments to host team building exercises ranging from “mystery bag” mashups to designing decorative papers. Our library staff programmed a Raspberry Pi to provide access to our online catalog, thereby replacing the need for a stand-alone computer. 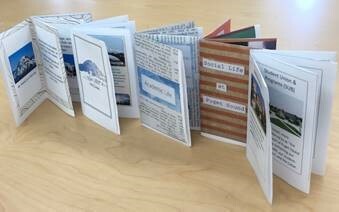 Students of Kristopher J. Imbrigotta and Nick Kontogeorgopoulos, who are both leading study abroad programs this summer, produced zines about Puget Sound to give to their host families. Skylar Bihl, who is teaching a class about building community, had students produce posters on the concept of intersectionality. Students continue to drop-in to the space to use the 3D printers, sewing machines, design tools and work together to create and make. We are excited about our most recent addition to the Makerspace: a laser cutter. Now through the end of the semester, we invite you to visit the Makerspace (by appointment only) to learn more about this new piece of equipment and how you might use it, and other Makerspace tools, in class to help foster creative assignments and projects. Full details about the laser cutter can be found on our Makerspace page. Below are a few images of items recently made. Remember – Your best search engine is a librarian! This entry was posted in Collins Library Links. Bookmark the permalink.